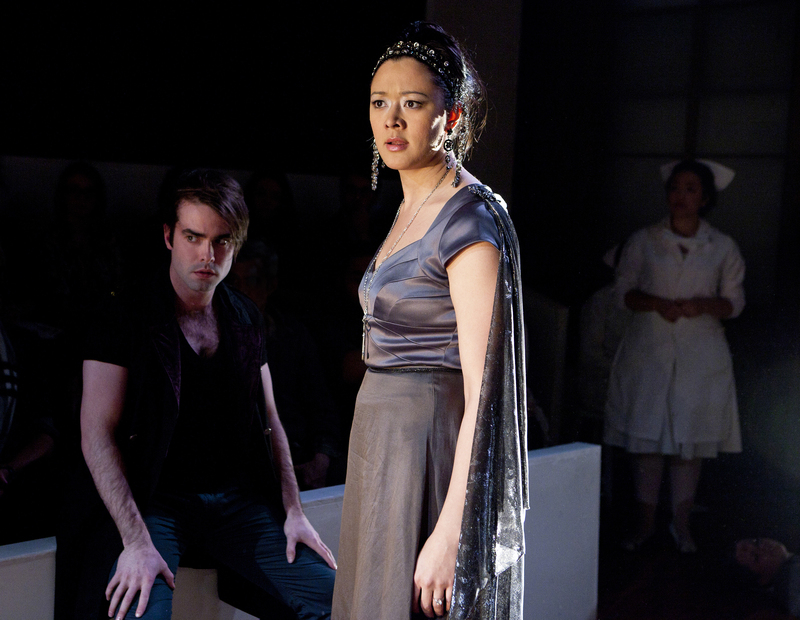 (L-R) Stephen Stout as Creon, Satomi Blair as Jocasta, and chorus/nurse. Photo by Laura June Kirsch. An education, an adventure, and a meal. Sophocles as only Sean Graney can adapt and the Flea Bats ensemble can perform. These Seven Sicknesses provides a modern gloss on ancient Greek myth as theatricalized by Sophocles (in seven plays) and now Graney in one. Oedipus, Antigone, Creon, Jocasta, Ajax, Clytemnestra, Elektra and more. Kings and queens and their disturbed and disparing progeny. And somehow, through a chorus of white clad nurses who sing in luscious counter-punctual creations that sometimes evoking The Story, sometimes Betty, and always lovely close harmonies, we simply feel the joy and pain of being human. Odysseus (Bobby Foley) and Orestes (Erik Olson) and Elektra (Betsy Lippitt) and Clytemnestra (Akyiaa Wilson) and Jocasta (Satomi Blair) and especially the haunting Antigone (Katherine Folk-Sullivan) and stories and names and constellations from secondary school and college. All inspire memories of the past and emotions in this present. Pauses at the ninety minute mark and again after an hour of resumed action bring food and conversation with the intelligent and engaging cast of actors, The Bats, who populate the Flea’s regular season plays. Go for the creative use of blood bags. Go for marvelous sheep and the rest of the flexible and often quite beautiful costumes by Loren Shaw. Julia Noulin-Merat has carved a black box and two-sided audience seating, and Ed Sylvanus Iskandar has choreographed fluid end-to-end action that calls to mind the original Lookingglass staging of Mary Zimmerman‘s Argonautika. Haunting and beautiful and compelling and quite filling, in all senses of the word. Ah, Kerry is keeping me honest! (and thanks for reading). I’ll make the correction STAT. And of course — I’m imagining the space, and it was the Water Tower location. Well duh Martha. No worries! I’m not sure if Mary has ever worked at Chicago Shakes — I just did a little mini-feature on her collaborators for her new show at Oregon Shakes (“The White Snake”), which will run in their in-house pub. Wish I could get to NYC, but it’s not looking possible til May at earliest. Thank you for coming to the show Martha! It was a real pleasure to chat with you — and glad to hear you enjoyed it!